Photo: ©Stephen Robinson / WILDFOTOAfrica.com. Gift is a young girl with albinism who lives in Zambia. Read her story at the end of the article. Ero as a child with her mother and siblings. In rural areas, people who practice witchcraft believe that the body parts of people with albinism possess magical powers capable of bringing riches and power if used in potions. These witch doctors pay thousands of US dollars for body parts, and hundreds of attacks in which people with albinism have been maimed or killed by attackers with machetes have been reported since 2000 in at least 25 countries, including Malawi, Mozambique, Tanzania, and Burundi. Children are particularly vulnerable to these attacks, and survivors and families of the victim have been severely traumatized. These attacks and murders have been linked to trafficking in body parts. 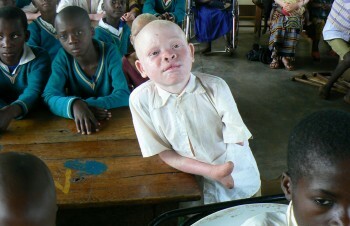 On March 07, 2015, a six year old boy with albinism by the name of Baraka Cosmas Rusambo lost his right hand in a witchcraft-related attack in Kipeta Village, Kipeta Ward of Sumbawanga Rural District in Rukwa Region, western Tanzania. His mother, Ms. Prisca Shaaban, also sustained serious machete injuries to her head. 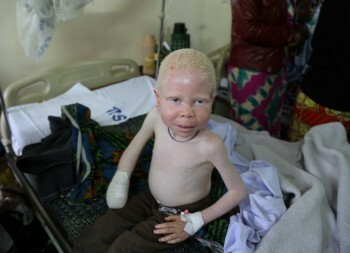 A 7 year old boy with albinism, survived a brutal machete attack on November 12, 2007. His arm was hacked off and the fingers of his remaining hand were also chopped off. Both were recipients of prostheses support from a collaborative venture in NY last year funded by UTSS, Global Medical Relief Fund and the UN fund for victims of torture. According to a Red Cross report, the market for these body parts is driven by wealthy and powerful members of society. In some countries where witchcraft is practised, attacks on people with albinism have increased in the months before an election, leading to speculation that political representatives are behind the demand. Survivors of these attacks face significant difficulties in having their cases brought to justice for many reasons: the victim fears further attacks; secrecy surrounds witchcraft; witnesses are unwilling to testify because of the ostracization they face; the victim lacks financial resources and knowledge of legal rights; and the families or community members of the victim are frequently involved in the attack. 22 October 2015: Ikponwosa Ero on the Human Rights of Persons with Albinism, presented at the 70th session of the General Assembly of the United Nations. Albinism is a condition characterized by the absence of melanin in the eyes, skin, and hair, and this frequently causes poor eyesight. Ero struggled in school because she couldn’t see the blackboard. Her mother, Comfort Ero, helped her with her schoolwork, and also knew that her daughter needed to wear sunscreen. Using her connections to friends in Europe, she managed to keep a supply on hand. Many Africans with albinism have skin cancer lesions, and a common misperception is that cancer is part of the condition. 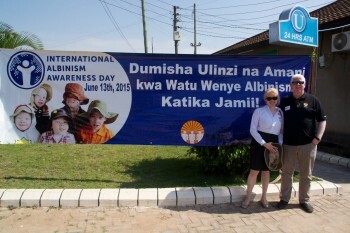 One study by dermatologists found that in Tanzania, 98 per cent of people with albinism die of skin cancer before age 40. Thanks to her mother’s vigilance, Ero remained cancer-free. Ero with Peter Ash, CEO of Under the Same Sun. In November 2014, the United Nations named June 13 as International Albinism Day, which was celebrated for the first time in 2015. In August 2015 Ero was appointed by the Human Rights Council to a position as Independent Expert on the enjoyment of human rights by persons with albinism. Her mandate is to work with the states in which the attacks have happened, with the goal of bringing them to an end. She also works to end the discrimination faced by people with albinism, and advocates for access to education and health. Ero at a 2016 advocacy-training workshop in Tanzania for women with albinism and mothers of children with albinism. Ero (second from left) in 2015 with some young victims of attacks. To draw attention to the important human rights issues associated with albinism, Zambia-based photographer Stephen Robinson has created a photo documentary, Life in the Shadows, to tell the unknown story of the everyday lives of those living with albinism in Africa. The sample story and slideshow below depicts the story of a young girl called Gift. The entire documentary can be viewed on Robinson’s website. 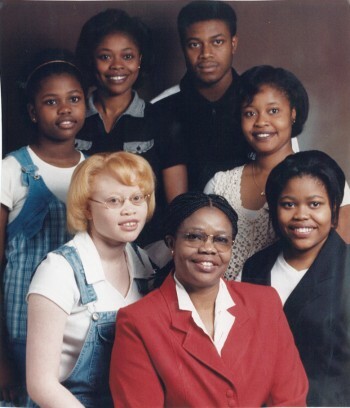 ‘Gift Chanda … was born as an albino. After her birth, the nurse said she’s an albino and I told her father that I have an albino baby. He said he cannot have an albino child and he told me that I am on my own and that’s how he left me and my baby. I named her Gift because she was my gift from God and my husband. I didn’t know how to take care of her – I was selling vegetables with her on my back not knowing that I am damaging her skin. I am staying in a very small house with no plaster, so flies and mosquitoes are biting her. As a result she started having sores, rashes and ringworms etc. That’s how the problem of the skin started, as young as she is. As a single mother still I am not managing taking good care of her because I don’t work and because of her I’ve stopped selling vegetables. Gift is a young girl with albinism. Photo: ©Stephen Robinson / WILDFOTOAfrica.com. The entire documentary can be viewed on Stephen Robinson’s website. …people say that for me to have an albino I am cursed including the baby. I am being laughed at and the child too. They’re calling her names that she looks like an animal because of the dotted skin. Some are calling her a woollen doll etc. Jenny Duffy, BCom’04, has a good head for business and a passion for dancing. She’s combined both skills into a career she loves. UBC’s Point Grey and Okanagan campuses are located, respectively, on the unceded territories of the Musqueam and Okanagan peoples. The only hope for alleviating or ending suffering is through increasing compassion and empathy and doing the right things; however, the right thing cannot be realized or known when superstition, ignorance, fear or lack of interest, awareness or education prevail. In the past there were leper colonies and mental hospitals, blacks only toilets and schools, gay bashing, gas ovens and genocides, and…. The world is a very mean unforgiving place- especially for the poor, the afflicted or different, the unsupported or targeted. But through informed progressive humanitarian education and natural faith things are slowly improving. But ignorance and fear are normal human defences and not easily trumped or ended. Power to change. Hope for all people, and cheers for the beauty of individuality and difference and healthful human diversity.